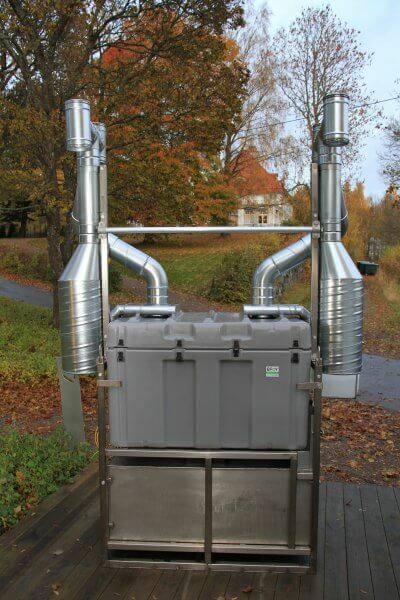 Environmental measurement station at Nimtek nature reserve, Sweden, 65˚59’ N, 18˚29’ E. Power supply for sensors, defrosting, data acquisition, and data communication during 9 months from October 2015 to July 2016. 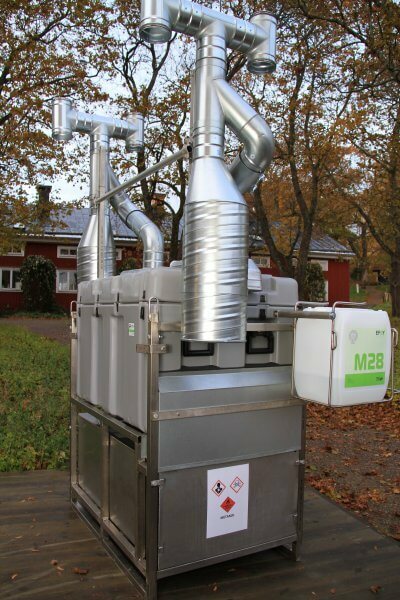 Due to the siting within a nature reserve, the measurement station had to be powered by clean energy (without toxic exhausts, pollution, or disturbing noise emissions). The remote location far from public roads could not be visited during winter and most of autumn and spring. Therefore a reliable, quiet, and clean power supply was required. Previously, intermittent power supply was achieved by solar panels and wind generators, with substantial power dropouts and consequential data gaps during the dark polar winter. Quiet, clean, and reliable operation along with remote survey and configuration capacities made EFOY Pro a natural choice to meet our specific challenges. Available accessories and interfaces facilitate system integration. 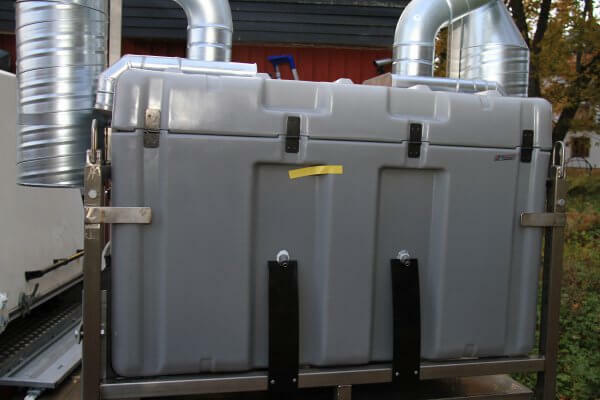 Studying arctic greenhouse gas fluxes is enabled by clean power supply. 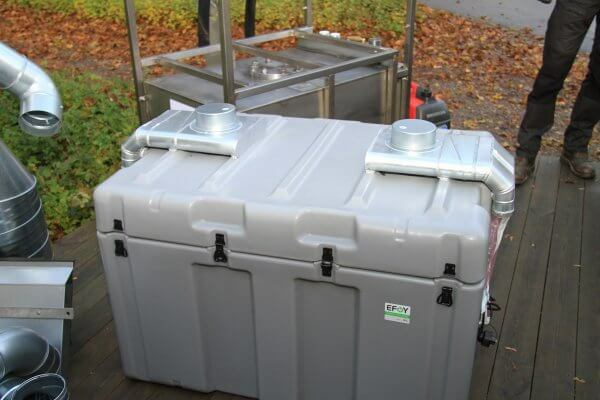 For redundancy, 2 EFOY Pro fuel cells are installed inside a modified Energy Box that is mounted on top of a 330 liter stainless steel methanol tank. 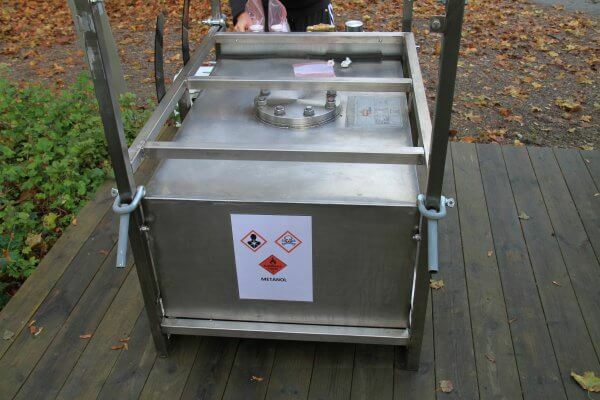 During regular operation, only one fuel cell will charge the battery pack that is integrated in the box. In case of switch off or failure of the primary fuel cell, the second one will automatically step in and continue charging. 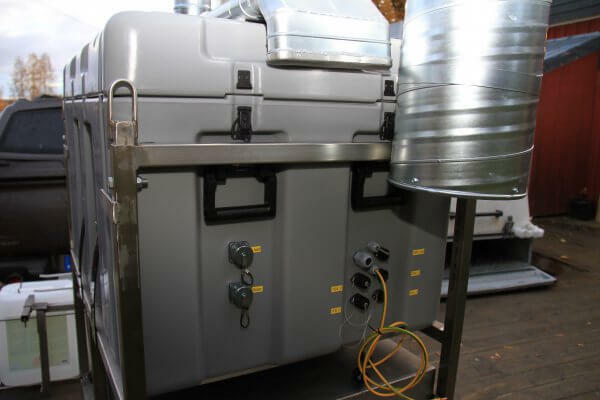 Temperature distribution within the box, fuel level, voltages and currents as well as all EFOY status variables are continuously monitored by a datalogger. Communication with the logger and the fuel cells is achieved by wireless broadband, GSM modem, land line or satellite link. 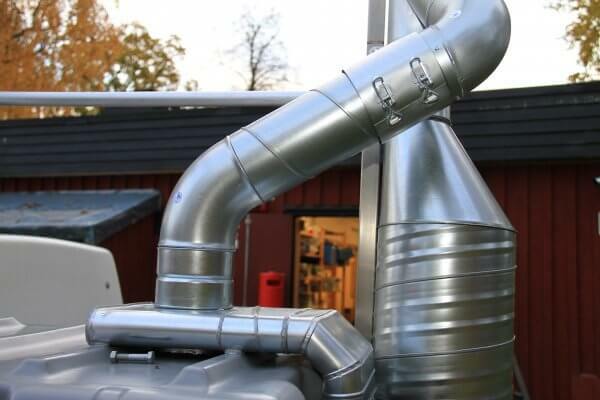 Ventilation of the box is achieved through H-shaped chimneys that prevent pressure gradients even at high wind speeds, thus avoiding snow accumulation within the box during events of heavy snow drift. The chimneys are even equipped with snow traps. A charging regulator for hybrid operation in combination with solar and/or wind power is integrated in the box. What are the benefits of using the EFOY in your application? For the first time, we are now able to measure ecosystem greenhouse gas fluxes continuously during wintertime in remote, arctic nature reserves. The scientific benefits are enormous and can hardly be expressed in numbers, because interactions between ecosystems and the atmosphere are crucial for understanding climate change.